Barry Schwarz originally uploaded by Jesper Rønn-Jensen. 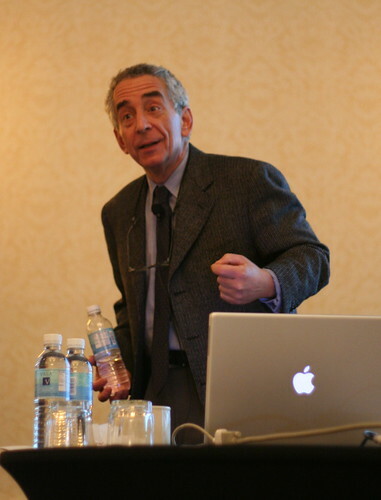 Barry Schwartz, best known for the Paradox of Choice and the need for simplicity, shared new wisdom during the MarketingProfs B2B Forum in Boston. This time, he discussed Practical Wisdom and the remoralization of professional life, the subject of an upcoming book. + Know when and how to make exceptions. + Know when and how to improvise [i.e., wisdom is the equivalent of moral jazz]. + Know how to use skills to pursue right ends. A wise person - or Mensch, a person of integrity and honor - is made not born! Schwartz shared the example of a hospital janitor whose job duties, although copiously detailed, included no mention of patients or customers. Yet, to better care for his patients, he exhibited moral will to do the right thing and moral skill to determine how to do it right. Not captured in the job description, but certainly a function of his own virtue and beliefs, and which added to the overall quality of the patient's experience. Shortly after hearing Schwartz, I encountered a New Jersey Transit Bus Driver who displayed amazing customer empathy: a frazzled woman got on the bus with her kids; she hadn't purchased her ticket ahead of time, had insufficient cash on hand [she missed the bus at the previous stop] and had parked her broken down car in an incorrect spot. Rather than tell the woman 'tough,' this driver accepted the cash, suggested she leave a sign under her windshield wiper about the breakdown, waited for her to do so, gave her a bus depot number to call [to prevent the car from being towed], and encouraged her to relax. Practical wisdom at work. Too often, in our zeal to document and orchestrate specific behaviors, we forget about human components - kindness, care, empathy. Rather than encourage wisdom, experimentation and independent thinking, we prefer instead to rely on excessive supervision. How often have you heard "we hate to do this, but we have to follow procedure" or "those are the rules" in situations that might benefit from some flexibility? Virtue and character supersede rules. Without virtue and practical wisdom, we wage a "war on wisdom" and ensure mediocrity, says Schwartz. Think of situations you've been in and how you learned. How did you deal with uncertainty? Did you take a risk? Did you try a new approach? How did you react given a specific incentive? Did you try to work the system to meet those requirements? Did the incentive lead to a superior result? How did you make sure you did the right thing? I've been reexamining my immediate world from the perspective of practical wisdom. My 7.5 year old daughter just finished a series of four weekly scavenger hunts. She required that I participate with her in the first and the second. By the third, tension built: I was supervising her too closely. She stated that she would do the fourth and last on her own. During the fourth scavenger hunt, she had to figure things out: pay close attention to the directions, organize herself and approach authority figures for information. She gained experience by herself. Although she didn't win one of the top three prizes [she came in fourth], my daughter was more proud and satisfied from her experience than when she earned 3rd place in an earlier hunt. My rules and guidance had stifled her creativity. She learned and so did I. Now, there's much more to practical wisdom. Barry Shwartz reminded us that we need strong upright exemplars and heroes [i.e., Menschs] like Atticus Finch or Interface's Ray Anderson, who has committed to reducing his company's environmental footprint and make it completely sustainable by 2020. Practical wisdom affects one's attitude toward performance, life, health and work [is it work? a career? a calling? or just a job?]. It adds meaning and engagement. It remoralizes all that we do. So, each and every one of us should nurture virtue and character, embrace practical wisdom and give others enough room to be human beings. My reaction: this fits into the zeitgeist of the times. We yearn not just for simplicity, but also for truth and trust, authenticity and long term focus to get our world back on track. It's what I admire and appreciate about the tools of social media which facilitate transparency, interaction, engagement and conversation with other human beings. I believe that many of us truly want to do the right thing. 1) To others' little acts of selfishness and unfairness - ENDURE PATIENTLY. 2) Amid your shortcomings and limitations - SEE THE BRIGHT SIDE. 3) When others are curt with you - SHOW GOOD HUMOR. 4) At the tiresome tempers of others - STAY CHEERFULLY EXCUSING. 5) When someone turns you down - PUT ON A GOOD FACE. 6) If someone helps, when you'd rather do it yourself - BE APPRECIATIVE. 7) When answering others - SPEAK GENTLY AND SHOW COURTESY. All virtues that I would love for my daughter to take to heart. Experience Barry Schwartz' Practical Wisdom presentation for yourselves in TED Talks Barry Schwartz on our loss of wisdom. And, in this video interview with MarketingProfs - Barry Schwartz: Practical Wisdom as a Business Tool, Schwartz puts practical wisdom into a greater business framework. What do you think about practical wisdom? How would you incorporate it into your personal and business lives? How do you go about ensuring that you do the right thing? Kinnelon, NJ – Christine Whittemore, chief simplifier of Simple Marketing Now LLC, delivered a presentation to executives in transition at the Parsippany, NJ offices of a major career management organization on July 14, 2009. As an expert on the subject, she was asked to address the practical social media knowledge that would enable executives in transition to use digital social tools to rebrand themselves, broaden their understanding of the digital marketplace and better research companies, brands and market segments of interest. Participants reacted enthusiastically to Whittemore’s expert presentation, expressing intent to set up their own Google alerts, research blogs relevant to their areas of interest and generally begin exploring online social tools like blogs, Twitter and other digital social platforms. “The marketplace has changed significantly and it’s important for executives in transition to be aware of and feel comfortable accessing digital and social tools to better market and position themselves with future employers,” added Whittemore. Whittemore urged participants to start by listening to the conversations taking place, explore and experiment with the tools available, and consider participating, but only after recognizing best practices and the rules of behavior essential to blogs and Twitter. Simple Marketing Now is a marketing communications consultancy that provides organizations with the right combination of traditional marketing and new and digital tools to improve the customer experience and build brand. For more information, visit http://SimpleMarketingNow.com. 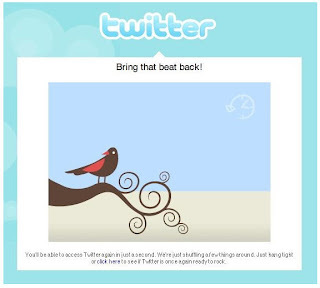 With so much talk about Twitter, are you curious how companies are marketing with Twitter? I certainly am. The more I experience Twitter as a means of connection and communication, the more intrigued I am with how it works on a local or specific level. I recently exchanged Tweets with a friend about a rice flour based pizza available at Whole Foods, and immediately received an automated Tweet from another party selling some sort of a pizza timer. What a turn-off! The trigger was the word 'pizza' and this autoresponse was not only inappropriate, but also hugely interruptive. Had that party engaged me in conversation, I might have been more amenable. I certainly would have been more appreciative. Nonetheless, I do see possibilities. Harness The Power Of Twitter For Local Marketing addresses some of those possibilities and lists pioneers using Twitter for local marketing. I particularly appreciate the tips that the author includes - ranging from instant coupons, promoting coming attractions, collaborative tweeting, promoting your blog, quick polls and including Twitpics of anything special taking place. The tip I add to the list is making sure that you have a human being fully engaged in interaction and conversation. Ban the autoresponder. Twitter Marketing Successes specifically addresses WholeFoods and Zappos [which has just been acquired by Amazon!]. The two have widely varied approaches to Twitter. Zappos exudes customer centricity, passion and humanity on Twitter [e.g., Tony Hsieh, the CEO, sent out this tweet today "Big day! Email I just sent to Zappos employees today about the Amazon acquisition - http://blogs.zappos.com/ceo..."]. Whole Foods is much more straightforward and focused, answering questions and providing information. Both are effective. Tweeters Use Twitter For Business describes how companies use Twitter. My favorite example is that of the gourmet Korean taco truck business in LA which uses Twitter to communicate [advertise?] when and where it will be so patrons can order food. Politicians use Twitter to hold discussions of relevance to constituents, and marketers can track mentions of specific topics or brand names. On 5/12/2009, USA Today published Banks try social networking, jump on Twitter wagon. Imagine, banks using Twitter "to reach consumers amid the economic downturn." Wells Fargo in particular I think is doing a nice job reaching out, connecting, interacting and helping customers. Many financial institutions are realizing that participating in social networks is no longer a matter of choice: their customers are actively participating and fully engaged in conversation about them [e.g., take a look at the kind of tweets that a search on bankofamerica generates]. If they intend to salvage their brands and be customer-focused, they had better take part! The best resource that I've come across recently is the MarketingProfs Twitter Success Stories [free with premium membership] which includes case studies about 11 companies using Twitter to build their businesses [including KogiBBQ, the Korean taco truck business mentioned above]. Are you marketing with Twitter? What do you find works best? + From Ann Handley: What'a a Dry Cleaner Doing on Twitter? + From CNN.com Can the Twitterati help sell your soda pop? Primary Complexity originally uploaded by Jeremy Stockwell. Yes, I'm biased in favor of simplicity and I love discovering references further supporting my bias. Imagine, then, my delight in finding proof positive that Simplicity Is A Dominant Trend! Before proof, I need to share with you simple inspiration. I love Rich Nadworny's post titled The Brilliance of Simplicity. He says: "Simplicity might be the hardest thing in the world to achieve. 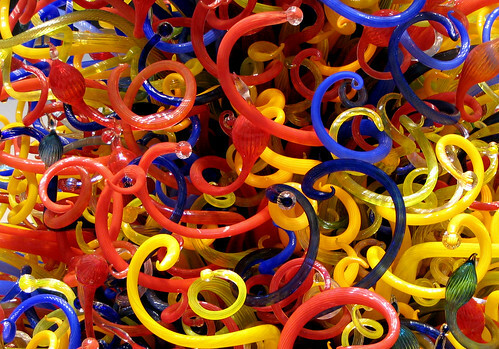 It’s much easier to take something and make it overly complex.... Our challenge is to make the complex simple." To achieve simplicity, read about There's brilliance in simplicity: the rule of one, two or three. Check out this SlideShare presentation from Oscar Berg. It visually makes the point in favor of Simplicity. View more documents from Oscar Berg. Then, there's The Frederick News-Post Online, which in its July 6, 2009 editorial titled "Enough, already!" puts the need for simplicity into consumer perspective given the choice fatigue we all face. "Savvy marketing types are signing on to his viewpoint and advising their clients to "end the chaos" by focusing product offerings through "a rigorous editing process." Those same advisers are bringing new titles and new company names to the mix. C.B. Whittemore, Chief Simplifier, Simple Marketing Now LLC, is a case in point. Now for the proof about simplicity being a dominant trend: a recent Harvard Business Review article titled "Understanding the Post-Recession Consumer" by Paul Flatters and Michael Willmott [registration or purchase required]. The subtitle states "A new thriftiness and desire for simplicity will combine with pent-up demand to shape buying behavior." This demand for simplicity is leading to "edited retailing, ... a growing demand for trusted brands and value, an increasing desire for advisors... that can simplify choicemaking, and enthusiasm for less complicated, more user-friendly technologies." The inaugural issue of Simple Marketing Now's Simple News e-Newsletter has just been distributed. Can you tell that I'm jazzed about it? Please, would you check it out? And, let me know what you think? 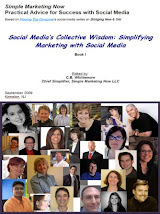 Here is a link to the inaugural July 2009 News from Simple Marketing Now. If you'd like to subscribe [I would love for you to do so! ], here is a link to the Newsletter signup form [or you can sign up via the form on the Simple Marketing Blog sidebar]. + The Floor Covering Institute series [Meet Ruland and Gould]. Mail Chimp is big on visual experience [and fun, too]. The charts are really cool, graphically capturing open, bounced, unopened and overall click rates [and complaints]. I can even see 'opens' by locations around the globe and over time. It also allows for social sharing during the distribution process. Thanks for checking out News From Simple Marketing Now. If you think of topics to include in the next issue, please don't hesitate to let me know. Back to my cool charts! This case study explores the creation of the Wear-Dated Carpetology Blog which I launched on December 27, 2007 - in anticipation of the redesigned Wear-Dated website launch date of June 1, 2008. The web is filled with misinformation about carpet products and the carpet buying process. Much of the content is confusing, focused primarily on price with a hard sell tone and has nothing to do with fashion or style when carpet is a product that enhances a consumer's home. Wear-Dated had the opportunity to simplify the carpet buying process, share accurate information about carpet styles, carpet care and carpet selection, while demystifying industry jargon, and celebrating the beauty and comfort of carpet. We were passionate about carpet and wanted to share that enthusiasm. Unfortunately, in the Fall of 2007, we were still a little over 8 months away from launching the redesigned Wear-Dated website. How not to lose all of that time time and opportunity to create carpet relevant digital content? How do so at very little cost? Based on my experience creating and nurturing Flooring The Consumer, I realized that a carpet focused blog represented a perfect solution: I needed little lead time and insignificant resources to launch it. Content ideas and resources were readily available within Solutia and Wear-Dated and I had already set up Google alerts to monitor stories relating to carpet. Next, I needed to put together a strategy, obtain internal buy-in and formally identify content resources. Wear-Dated had launched the By The Foot marketing campaign in December 2006. The new website would reflect this look and quirky yet stylish feel. The By The Foot campaign included the notion of 'carpetology' or the science of feet and how they, as the best-qualified body part, evaluate carpet. No surprise, we incorporated that science - and whimsy - into The Carpetology Blog. Given that women represent our core consumer, making or influencing over 85% of the purchasing decisions, particularly in the home, we considered it critical that this blog authentically represent a woman's voice. We decided that the Women of Wear-Dated would be the blog's voices. The Women of Wear-Dated consisted of: Marianne Cone, Ann Hurley, Annette Smith, Elizabeth Hise and Christine Whittemore, who was editor, chief content creator and strategist. 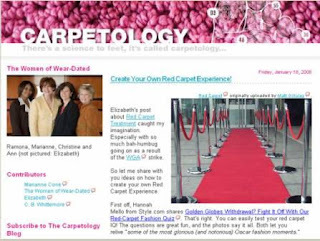 The Carpetology Blog launched six months prior to the website launch date, on December 27, 2007. As of 3/24/09 [my last official day with Solutia and Wear-Dated], The Carpetology Blog had generated 37, 543 visits averaging 1:14 minutes per visitor and a total of 57,686 page views. It continues to generate healthy traffic despite no new posts since then. We generated 181 stories ranging from stories that specifically promoted Wear-Dated [e.g., See About Us: What is Wear-Dated], to stories offering valuable tips, advice and recommendations, interspersed with 'carpet in the news' stories, color trends and design site reviews. I created a video series titled "A Foot's Perspective" -- showcasing perspectives on and from carpet, celebrating beautiful carpet and offering ‘how to’ tips on caring for carpet -- and a series addressing common consumer complaints and warranty issues. Here are the top five reasons for visiting The Carpetology Blog. Valuable, credible and authentic content, better qualified website traffic, a strong digital presence, a casual forum for celebrating all of the benefits that carpet offers -- including beautiful, stylish carpet -- a positive ROI and buzz at no cost. So much so, that it not only bridged the 6 month gap until the introduction of the Wear-Dated website, but The Carpetology Blog even outlived the business itself and continues to generate excellent traffic all by itself. Image courtesy of Leigh Bureau. According to Steven Berlin Johnson -- who spoke during the 2009 MarketingProfs B2B Forum -- we are in the midst of a modern-day Enlightenment. You know, when the 18th century coffeehouse [and other public institutions like books, academies, journals and debating societies] made its mark, creating public spaces where conversation took place freely between people from all walks of life and multiple disciplines, amateurs and experts alike -- all sharing perspectives that generated change at an unprecedented pace. Not so different from the interactions taking place today through social networking tools like Twitter. Steven B. Johnson's keynote presentation addressed many of the points from his just published Time article -- How Twitter Will Change the Way We Live [I strongly suggest you read it] and had me re-evaluating the various social tools I've become familiar with. Twitter has "unsuspected depth." Not only does it offer 'social warmth' [i.e., all of those details about what one had for breakfast], but, thanks to user-created innovations ['jury-rigging the system' to do things never imagined by its creators], it has opened up conversations about otherwise closed or unknown events. In the article, Steven refers to Hacking Education, a small, private event, which Twitter transformed. Tweets with the "#hackedu" identifier drew the attention of those outside the event, brought in valuable real-time new perspectives, created a public record as well as a platform for continued conversation on the topic. The room in which events take place becomes significantly bigger via virtual participation. Events, topics, and brands come alive with meaning. Those interested can share in common experiences regardless of geographic, intellectual, socio-economic or any other differences. I found fascinating the realization that Twitter users invented how to deliver value to users. For example, the hashtag [#name] identifiers for specific events or topics and the @name to reply to specific Twitterers were invented by users. Search functionality developed outside of Twitter, although it has since been incorporated [acquired]. When I first describe Twitter, I immediately hear noise about the inane quality of so many Tweets. How can substance be conveyed in 140 characters? [Read A categorical imperative to twitter by Gideon Rachman.] And, yet, think of the role the platform has played in conveying information about recent 'unfolding events', and the pulse on shared national experiences [i.e., Twitter trending topics]. Furthermore, what Twitter does very well, via shortened URLs, is point followers to articles and blogposts of potential interest. Johnson then spoke about the evolution of social searches - something that Twitter as a search platform epitomizes. Unlike Google searches which are mostly anonymous, Twitter searches offer relevance with a human face! Your social network passes along news and links [something Facebook now does, too]. It helps filter relevance more effectively than an anonymous one. The fundamental element evolving in all of this is people, not pages or brands: social networks + live search + link sharing. I'm experiencing Twitter differently as a result. I love how it allowed me to attend NeoCon virtually and am intrigued with how it integrates into overall marketing strategies. What do you think these tools mean for your business? + This YouTube interview of Steven B. Johnson at the MarketingProfs B2B Forum lets you hear Steven discuss firsthand Twitter, what it means for businesses, and why he thinks Twitter shouldn't be dismissed. 4th of July originally uploaded by GR58. I wish you, your friends and your families a wonderful July 4th Holiday! I hope it's filled with sunshine and friendship, good conversation, summer foods and an opportunity to unwind. Fingers crossed, too, that we have no torrential downpours! 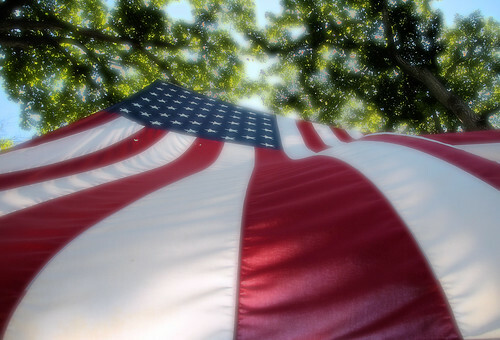 Happy, happy 4th, and thank you for being a part of The Simple Marketing Blog!